Weather Chum is a new weather app for the iPad and iPhone that brings a fresh new cartoon-style animated interface. There are lots of good and even great weather apps for the iPad; but this one is unique as far as I’m aware in bringing a playful spin to things. The app offers animated characters and animations to reflect current conditions, and accompanying sound effects. It also lets you share your current weather conditions on Facebook in a fun, comic-book style. Yahoo’s beautiful weather app has arrived on the iPad, and it’s a lovely breath of fresh air on the iPad screen. As of yesterday, Yahoo Weather is now a universal app that runs on both the iPad and iPhone. I’ve seen a number of handsome weather apps for the iPad, including long-time favorite Clear Day, but Yahoo Weather is a perfect storm of a great, clean UI and spectacular photos. The photos are pulled from Flickr and used as the full-screen background in the app. The app also offers a wealth of good weather information. On the main page you get a quick overview of current conditions and today’s forecast by sections of the day. 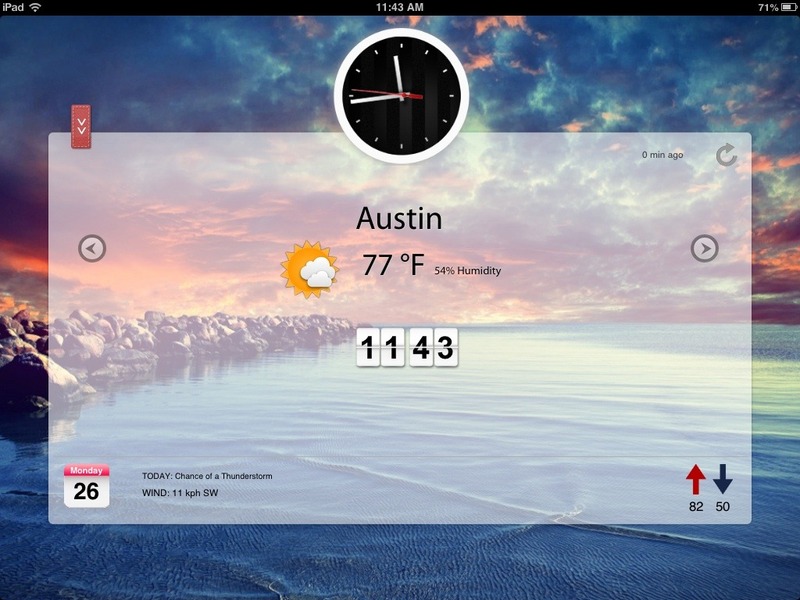 WeatherCube is a minimalist, gesture-driven iPad weather app. It’s got a just about invisible interface that’s all about simple taps and gestures to navigate through your weather information. I think it’s probably one of those apps you’ll either love or hate. If you like minimal UI style apps like Clear for task management, then you’ll probably enjoy WeatherCube. If you are not a fan of this sort of minimal UI, then you’ll likely want to steer away from this one. Check out my screencast demo of it above for a good look at how the app works. I don’t think it’s going to replace Weather HD as my go-to weather app, but I do think it’s nicely done and a clever idea. Let me know in the comments what you think of the app / the demo. I like minimalist, good looking weather apps for the iPad. That’s why Weather HD has been a favorite of mine for a long time. Breathe for iPad is touted as just the sort of sleek little weather app I tend to like – the App Store page for it calls it cool, intuitive, and awesome. I’ve been giving it a spin over the last week or so, mainly on my iPad mini. Like Weather HD, and many imitators, the app lets you use ‘dynamic’ backgrounds. You can choose to use these or just a plain, fixed background. The backgrounds are attractive enough, but the word dynamic is a bit of a stretch to apply to them – as they’re still static images that are rotated once in a while if conditions change, not video images as in Weather HD. So you get a sunny sky image for sunny days and appropriate stormy images when there’s inclement weather. 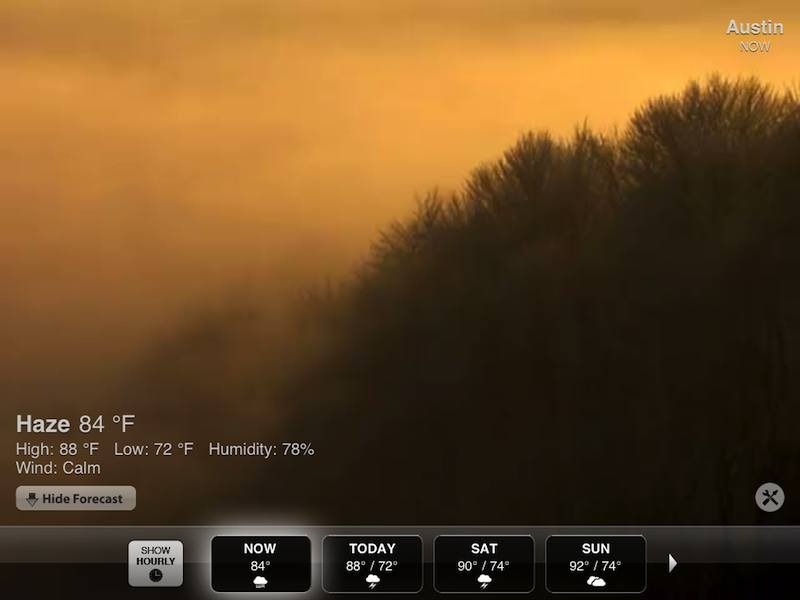 You can toggle on or off some ambient sounds to accompany your weather browsing. I turned these off pretty quickly. 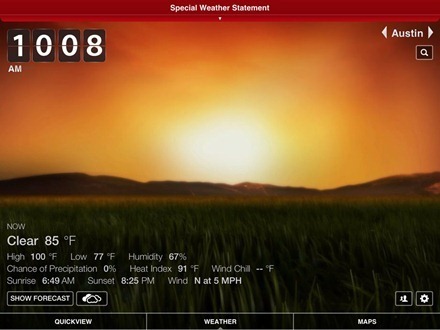 Weather HD 2 for the iPad and iPhone has been released on the App Store today. This is a huge update to the already outstanding Weather HD app. Or, as its developers say, a brand new ground-breaking release. Bringing amazing new design and revolutionary new features. The new Version is 2.0.0 for those scoring at home, and it really is packed with great new features. This has been my favorite iPad weather app ever since it first hit the App Store back in 2010. It has always boasted a beautiful, simple UI and striking video imagery, and was a repeat selection in our list of Best iPad Apps of 2011. 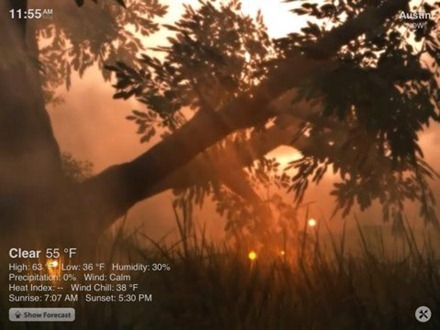 ● New stunning weather animations. 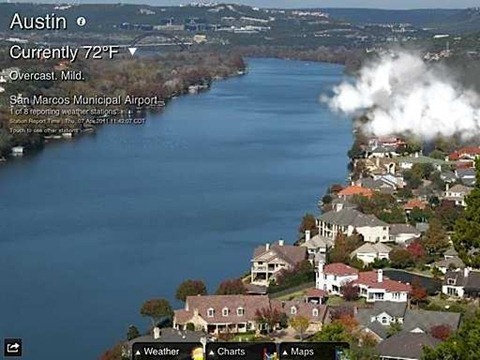 ● 3D Weather Maps, like you have never seen before. ● QuickView to see the weather at multiple locations at once. ● Severe Alerts with Push Notifications (USA & Europe). ● Social: see your friends’ weather and share yours. ● MultiForecast: add Accuweather & MeteoGroup with in-app purchase. Now you can show the Sunrise and Sunset in the forecast details. Enable them from the Settings. A little thing for sure, but one I’m quite fond of – especially at this time of year where it gets dark so early. The recent 1.6 update for Weather HD also added new weather animations, compatibility with iOS 5 and Heat Index, Dew Point, and Wind Chill details. This has always been my favorite iPad weather app because it’s just beautiful (many apps have imitated the video animations it uses, but none have done them as well) and it’s great for quick, at a glance weather checking. I’m happy to see it continuing to add little bits of information like this, especially as it offers the ability to toggle these on and off individually per your preferences. So if you want to see sunrise times but do not want any heat index or dew point info, it’s easy to set it that way. Here’s an App Store link for Weather HD; it’s priced at $0.99. 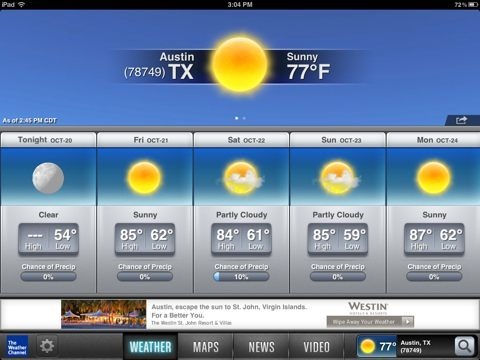 The Weather Channel for iPad has been updated today, to Version 3.0.0. The highlight of the update is brand new design for the app – that features animated weather backgrounds ala Weather HD and more interactive elements. The update and new design are apparently based on feedback from users. It’s been quite a while since I’ve used The Weather Channel app, so I have no direct comparisons to make with how it looked before this 3.0.0 update – but I can say that it still offers a strong set of weather information and now looks a fair bit prettier than I recall. The update also added support for iOS 5. Here’s an App Store link for The Weather Channel HD; it’s a free app. If any of you are long-time users of the app, I’d love to hear what you think of the new design refresh. Magical Weather is a new weather app for the iPad, released today. It’s a bit like the excellent Weather HD app, in that is uses a set of animated images to reflect current conditions – but it offers a little more detail about the current weather. MyWeather Dial is a new weather app for the iPad, released last week. It’s definitely in the ‘light’ weather app category – as it contains just a fairly basic amount of weather information and no weather maps or in-depth data. I’m a fan of simple iPad weather apps (Weather HD has been my favorite for a long time) so this one caught my eye immediately and I’ve been using it for a few days now. 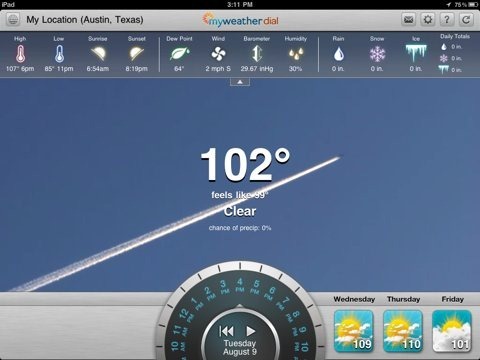 The app’s unique feature (hence the name) is the big weather dial that sits at the bottom center of its screen. This lets you hit the Play button and watch the weather forecast for the next 7 days play out hour by hour. You can hit Pause at any time or hit Rewind to return to current conditions. 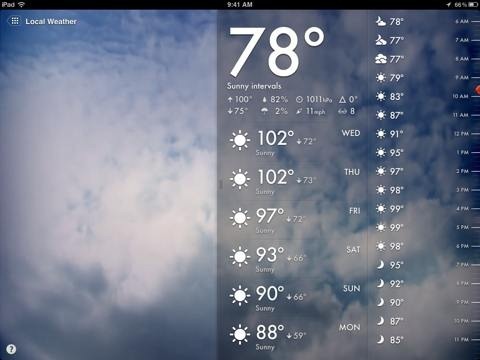 Weather HD has been my favorite iPad weather app since the very early days of the iPad. It’s not for everyone, as it offers far less information than many heavyweight weather apps – with no maps and charts for example. Here’s the main reason I love the app. The video images are just stunning. This has been a weird week for weather here in Austin, and today is a ‘calm before the storm’ sort of day. I had no intention of posting about Weather HD today, but I opened the app a few minutes ago to check on the weekend weather and once I saw the above image I couldn’t resist sharing it. If you haven’t had a chance to look at the app, here’s an App Store link for Weather HD; it’s priced at $0.99 and it’s a universal app, designed to run on both iPad and iPhone. 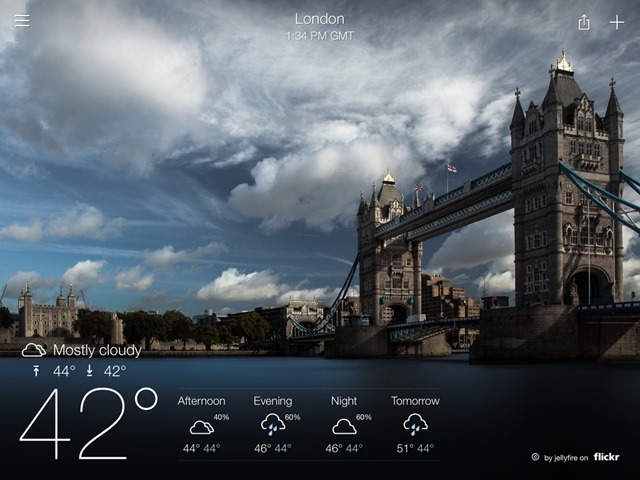 Fizz Weather HD is one of the latest weather apps for iPad to hit the App Store; released just over a week ago. Fizz Weather itself has been around for years on various mobile platforms and the iPhone version has been in the App Store since 2008, shortly after the store launched. I always liked Fizz Weather back in Windows Mobile days and also enjoy their iPhone app – so I was keen to give their new HD version for the iPad a look, and I’ve been using it for the last several days.